Two photos and a program — dated exactly one hundred years ago today — inaugurate the Pique of the Week, a blog by the Local History Room volunteers and staff. As we begin to put our Kingston photographs online, we will post things that stand out, answer a question, or like today’s picks, just catch our fancy. So what happened 100 year ago today? Old Home Day! 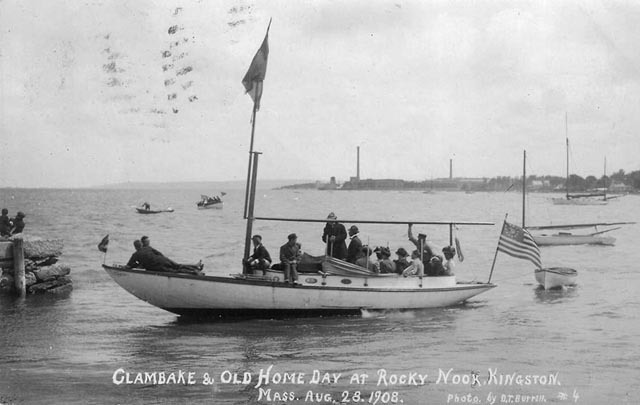 These late summer celebrations began in New Hampshire in 1899; other New England states and some Canadian towns quickly adopted the practice, which flourished into the early 1920’s. While the events might include parades, pageants and picnics, as well as sports, dances, bonfires and clambakes, a sense of nostalgia, shared history, and local pride always took center place. In the second, we see Delano’s Wharf fromthe shore, with people gathered for the festivities, maybe watching the boat races or waiting for the traditional clambake to start. A sailboat pulls up to the Wharf and dories scoot around the Bay. In Kingston, the 1908 celebration featured a parade that began with a bicycle brigade (cycling was still a new sport in 1908). It boasted 22 floats including a yacht under full sail contributed by the Kingston Yacht Club. The parade ended at the Town Green with refreshments for the children on the floats and a band concert. Later in the week, there were water sports, a yacht regatta, a clambake and a dance on Friday. 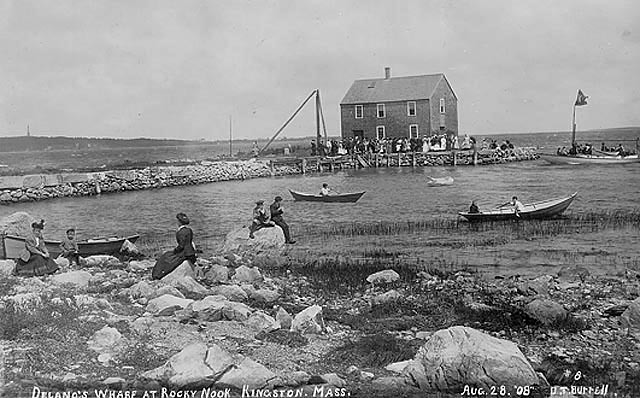 Kingston’s Old Home Day celebrations continued through the 1930s and included a revival in 1996. Sources: Vertical Files collection;The Encyclopedia of Local History, Carol Kammen and Norma Prendergast, Editors (AltaMira Press, Walnut Creek, CA: 2000).